There is a near consensus that social media marketing is valuable because it allows companies to directly engage with their customers, build brand presence, and ultimately sell more products. 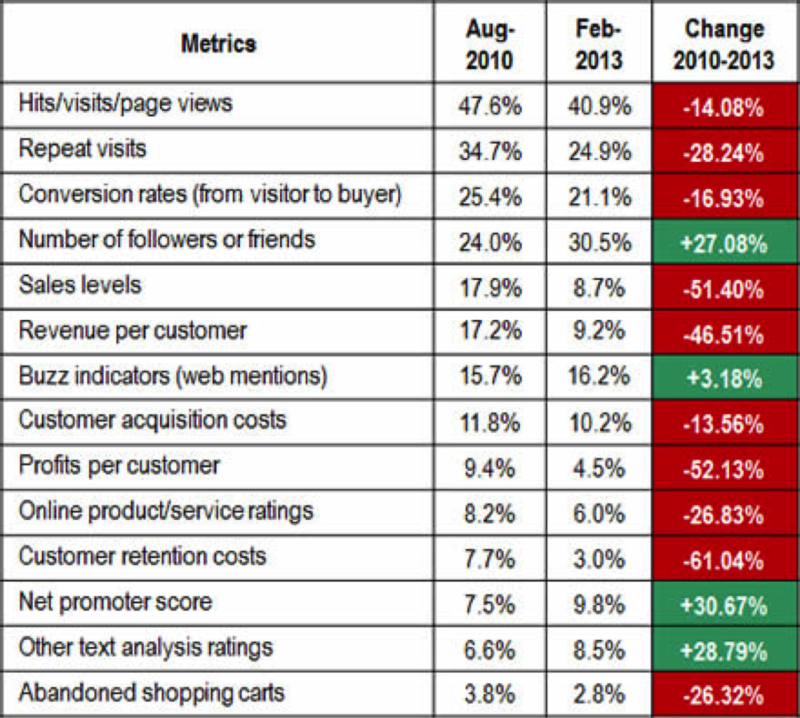 However, justifying the value of social has been a conundrum for brand marketers over the last 10 years. Even in the most straightforward cases of ecommerce, there’s still the attribution question. How much do you attribute to the relationship with the brand versus the last click? 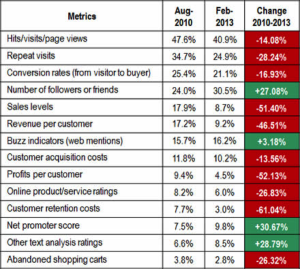 What makes measuring social ROI so difficult is not a lack of data, but identifying which pieces of data matter. The metrics for social media used to be all about likes and followers. That was the first step. Now social media enables core business objectives and provides so many different metrics and new data streams on customers and their behavior. I wasn’t surprised to find that there are some really smart people already working to tackle this social ROI problem; in an attempt to get educated on the topic, here’s what I found. The different metrics range across the board from true financially based numbers, such as “profits per customer”, to social media specific actions like followers & friends. In addition, according to the study, ‘voice-based’ metrics such as net promoter scores and text analysis are quickly becoming strong indicators of success. As Gary mentioned in his Inc 500 speech, word of mouth is a currency that affects your bottom line, and social media allows word of mouth to scale. Thus, it makes sense that companies want to measure conversations about their brand. Another worthwhile read is the Altimeter Group’s Social Media ROI Cookbook. The report does a great job of mapping the problem that marketers face. 56% of marketers still list the ‘inability to tie social media to business outcomes’ as the largest pain point of measuring social media ROI. 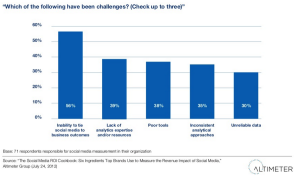 As the study goes on, the Altimeter group prescribes six ways to help measure revenue impact of social media. What resonated with me strongest was the call to action for more integration between social media and purchasing opportunities. By using more links, tagging, and direct commerce in social media deployments, companies can create a frictionless buying opportunity for the consumer as well as make measurement of ROI much easier. For me, social media is the channel that I rely on for recommendations on products, music, sports, and the other things I like. As more and more social media platforms begin to emphasize photos, and linking them to purchasing opportunities, brands will need to measure visual content as a form of “word of mouth” marketing. Ultimately, it’s clear that social content marketing will continue to become more and more ubiquitous and I believe that brands will need to make social an integral piece of their marketing efforts. In Gary’s words, they’ll need to learn how to become social media experts both in usage and in measurement. This article was syndicated from Business 2 Community: What Is The Value Of Social Media Engagement?